The Poppin's Book Nook theme for this month is School! As a homeschool parent, coming up with a good book about school was a little difficult. 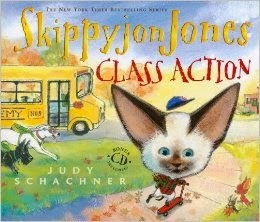 Luckily Skippyjon Jones to the rescue in Skippyjon Jones Class Action. The reason I chose this book, other then the fact that my girls LOVE Skippyjon Jones, is that it is not your typical book about school. Actually Skippyjon wants to go to school, but his mama tells him only dogs go to school. So in typical Skippyjon fashion, he enters his closet and his imagination to board the bus for school. This is where he learns of the "wooly bully," a dog that spins around in a teacup and always seems to be growling. 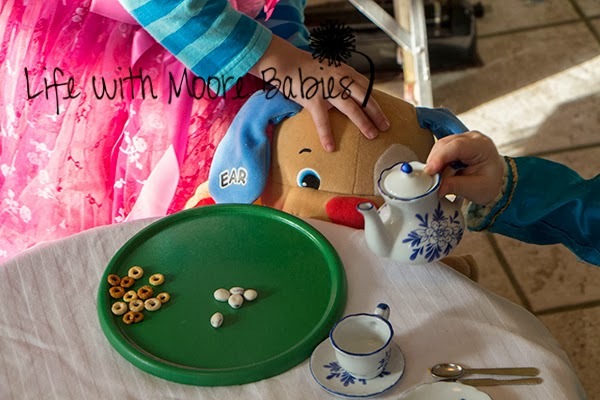 Of course Skippyjon gets to the bottom of it, learning things aren't always what they seem and (spoiler alert) the "wooly bully" is simply hungry, so his tummy is doing the growling! This book provided a good way to talk about how others may be different, but everyone should still be treated with respect. My girls know they are homeschooled. They know other kids go to school, and I think this book helps them see that both ways are okay. In this case dogs go to school while cats don't. Real life isn't that simplistic, but they can see what works for one person doesn't work for another, and that's okay. We also got to talk about not assuming things based on outward appearances because what seems to be true isn't always. You have to treat others how you want to be treated and get to know them for who they are and not how they appear. 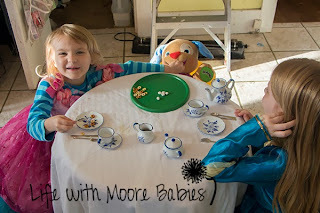 Because the "wooly bully" spins around in a little tea cup, we took the opportunity to have a tea party. 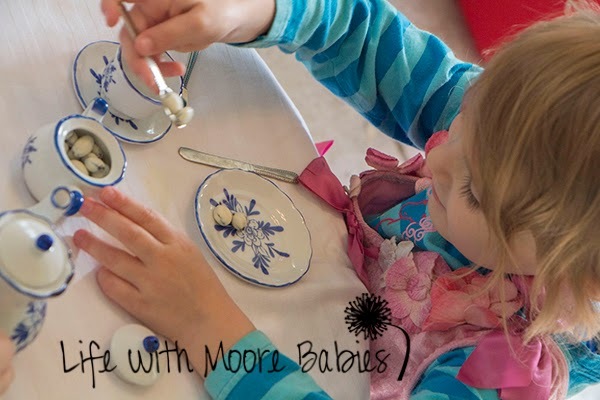 The girls love having tea parties with their little ceramic tea set, and they know when the do they have to be on their best behavior, so they don't break it! That also mean they have to use their best manners. 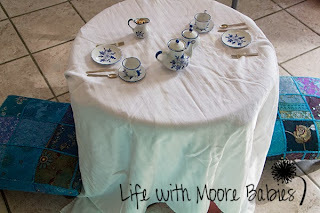 After they had enjoyed their tea for a while I decided to invite someone else to the party. 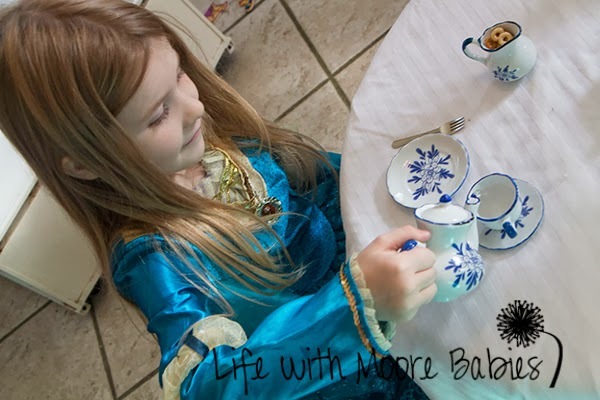 I didn't trust Eli with the tea set, so I just grabbed a stuffed dog. I set him at the table and asked them what they should do now that someone new had joined their party. They were quick to find him something to use as a plate and to share their tea. They even pretended to help feed him. 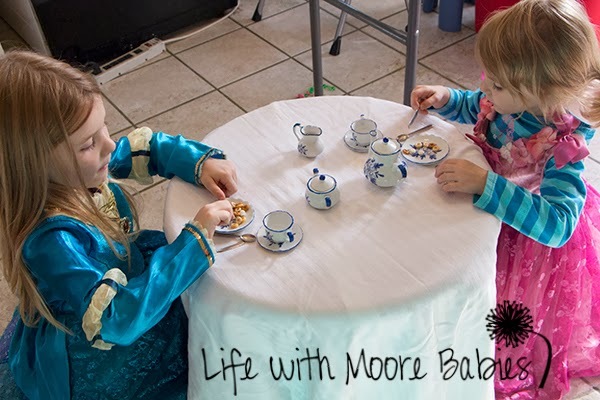 I think learning how to treat others is definitely more important then academics at this age (at any age really), and tea parties are a fun way to practice! 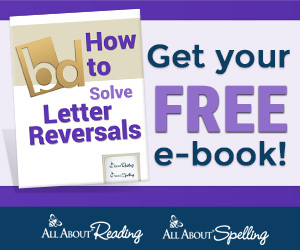 This month we have the opportunity (US only please!) 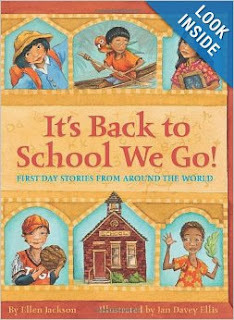 for you to win a copy of It's Back to School We Go! This books talks about what school is like in other countries; a great way to learn even more about diversity in learning! 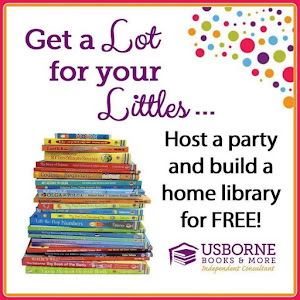 Be sure to stop by and read the great school selections from all the participating bloggers!